I was wondering through the Olde Lolly Shop in Margaret River, Western Australia a couple of weeks ago and I stumbled on some interesting and nicely framed commercial images. On their own, they were lovely collectibles if you are into that sort of thing; but for me a picture of some of them was enough. What it made me think about was a pattern of identification that one can see in the development of twentieth century advertising. The relationship to an iconic image implies a more "representative" structure and relationship in a kind of triangulation between the product, the character that somehow embodies the spirit of the product, and the consumer or viewer. 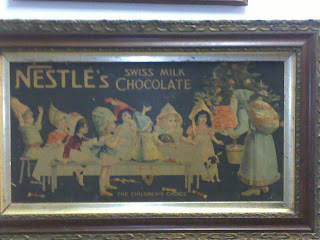 So, in the late 19th/ early 20th century, you can see the effort to produce some romanticised iconic scene with the Nestle image. It is idealized, perhaps overly cute which may intersect with the contemporary Japanese aesthetic; but there is no attempt to focus the attention on how the scene could be replicated – even simplified – into a consistent character of identification. 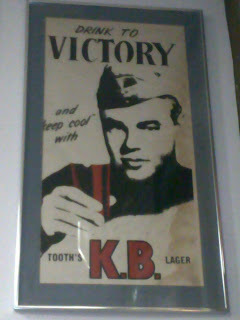 But if you look at this image, also retrieved from the same Olde Lolly Shoppe in Margaret River, one begins to see by the mid- 1940s stronger efforts at establishing associations and efforts to make the character embody the product and its spirit. 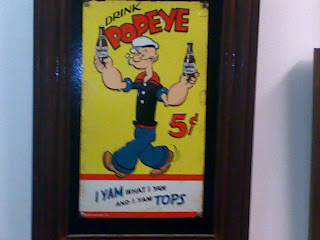 By association, the character, in this case Popeye, is designed to produce a representative relationship to the consumer: Tops is individualised through the avatar of Popeye = I Yam what I Yam and I Yam Tops. The soldier is in every way quite beautiful, but he is significant in his personality and it is a personal but celebratory relationship to his product of choice. There is the iconic embodiment where the soldier represents a relationship to the will of a nation in this case.